A big, bright Full Worm Moon will appear in the east on Wednesday at almost the exact moment spring begins in the northern hemisphere. It’s the first time in 19 yearsthis link opens in a new tab that’s happened, though this one is even more special because the Full Worm Moon is also a supermoon. It’s a full moon, and that’s really it. Although the Super Worm Moon could also rightly be called the Super Sap Moon or the Super Crow Moon. Known by Native Americans as the Worm Moon because of the seasonal appearance of earthworm trails, March’s full moon will be visible from dusk on Wednesday, March 20 until dawn the following day. Although the Super Worm Moon officially reaches 100-percent illumination at 9:42 p.m EDT and 6:42 p.m PDT, it’s much more impressive if viewed as it appears low on the horizon. That can be a truly exquisite sight, clear skies allowing, which happens once per month for just a few minutes. No wonder many stargazers rate the rise of the full moon as one of the greatest sights in nature. In New York, sunset is at 7:07 p.m. EDT and moonrise is at 6:48 p.m. EDT, while in Los Angeles sunset occurs at 5:41 p.m. PDT, followed by moonrise at 6:58 p.m. PDT. So in western U.S. states the Super Worm Moon will rise just minutes after its maximum fullness. Spring Equinox is also on Wednesday, at 5:58 P.M. EDT and 2:58 PDT, and though it has nothing to do with the full moon, the two virtually coincide. If the sky isn’t clear on Wednesday, check again at dawn, when the moon will be setting in the west. In New York, sunrise is at 6:58 a.m. EDT and moonset 7:37 a.m. EDT, while in LA, sunrise is at 6:31 a.m. PDT and moonset 7:37 a.m. PDT. It’s not an astronomical term, instead coined by an astrologer in the 1970sthis link opens in a new tab, so it lacks a rigorous definition, However, it popularly refers to the point in the moon’s monthly orbit that is closest to Earth. Since the moon has a slightly elliptical orbit, there are two points in its orbit when it’s furthest away (a micromoon) and closest (supermoon). Both of those things happen once per month, but it is only when a supermoon combines with a full moon that anyone pays any attention. That’s because a supermoon is bigger and brighter than most full moons. Why are there so many supermoons in 2019? 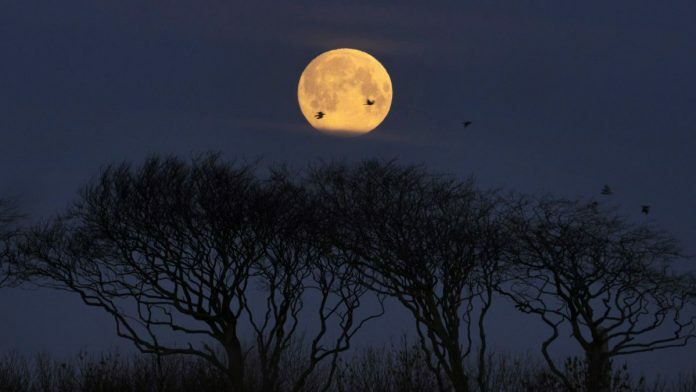 The Super Worm Moon is indeed the third supermoon in a row, after January’s Super Wolf Blood Moon (which was also a dramatic total lunar eclipse during which the moon turned red) and February’s Super Snow Moon (which was the biggest and brightest of 2019 and the nearest full moon to the Earth until December 2026).